The following script allows the user to enter a function, including math functions (math.sqrt, math.sin, etc). The function is entered as string and when calculation is needed, the eval function is called. Such as math.sqrt, math.sin, math.exp, etc. Remember the default angle measure is radians. This review will mainly focus on the HP Solve and Lotus 1-2-3 apps, as if I had not have the chance to try other apps at the time of this review. Thank you to Dave Bitten for this wonderful computer! This is the first portable computer of the 1990s HP series that I have. I traded my Casio fx-Algebra 2.0. The HP 95LX can also hold a RAM disk, for permanent storage. 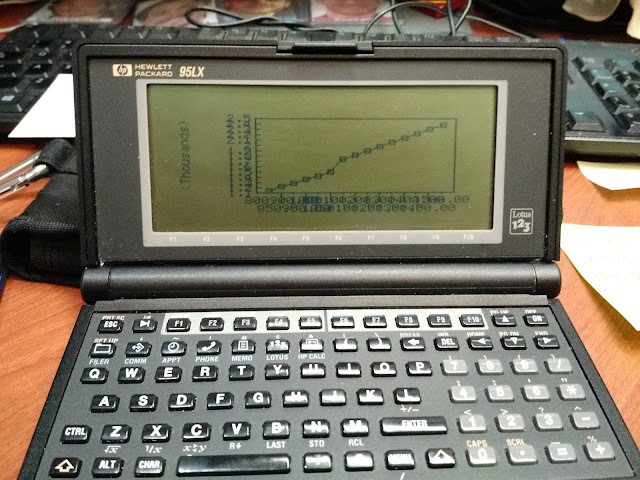 The HP Calc is based off the HP 19B calculator, but adds a graphing calculator component. The HP Calc can be operated for in either Algebraic or RPN (reverse polish notation). HP Calc had financial solvers (time value of money, interest conversion, cost/sell/margin/markup), conversions (currency, length, area, volume, mass), and scientific functions (random numbers, logarithms, exponentials, trigonometry), and list editor. 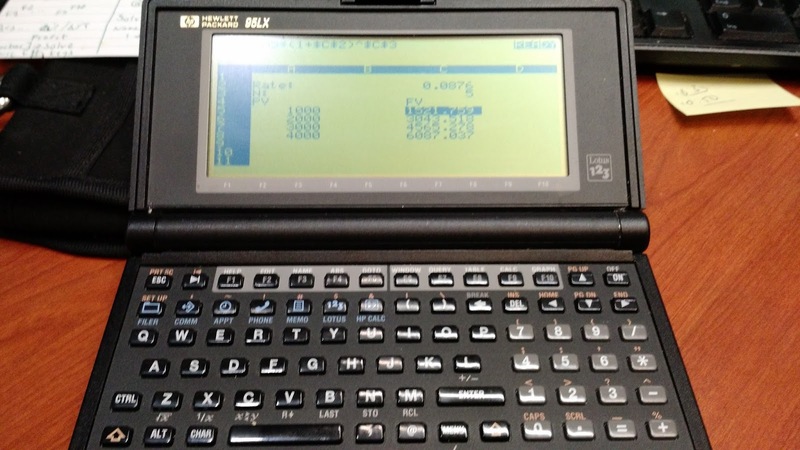 The solver is also based off the HP 19B, and also includes all the advanced features of the type of solver that was present on the HP 17BII+, HP 17B, and HP 27S. * IF: If statement with one command then and else command. If statements can be nested. * SIGMA: The sum of a sequence. The increment is specified. Similar to Σ(f(x), x=a, b). * S: Solve: Used in an IF statement, dictates which calculations to make depending of which variable is solved. * L: Let: stores a value in a variable during a formula. Before Microsoft Excel, Lotus 1-2-3 was the favorite of spreadsheet applications. Lotus 1-2-3 is easy to use with a good resource, like the awesome HP 95LX manual, download here: http://hpmuseum.net/exhibit.php?hwdoc=202. What is really nice about the Lotus 1-2-3 is the ease of creating macros. The only caveat is the macro is typed in code (depending on key stroke, such as \ for Menu, the first letter to choose commands, a tilde (~) for an enter, and other commands to move the cursor or ask for input). Macros are assigned to the keyboard (called by Alt + letter). On Lotus 1-2-3, date functions handle years between 1900 and 2099. The ON key toggles the HP 95LX on and off. No waiting for the computer to start up, which is nice. The keyboard is a QWERT keyboard. Even though the keys are little small, they are pleasure to press and keys are responsive. I am also impressed with HP 95LX’s sharp display. The text on screen is very readable. The screen is not backlit, understandable for the technology of the early 1990s, which backlighting would put a high demand on its battery. I am very happy to have an HP 95LX. If (really when) I get a chance, I want to take a look at DOS programming, playing around and expanding the limits of both HP Calc’s solver and Lotus 1-2-3. So far, so good. Hewlett Packard. “History of the HP 95LX computer” http://www.hp.com/hpinfo/abouthp/histnfacts/museum/personalsystems/0025/0025history.html Retrieved October 17, 2017. Each row, column, and diagonal of this magic square has a sum of 15. A proper magic square has the integers 1 through n^2, n is the size of the magic square. A non-normal magic square follows the sum rule, but different integers than the 1 to n^2 sequence is allowed. 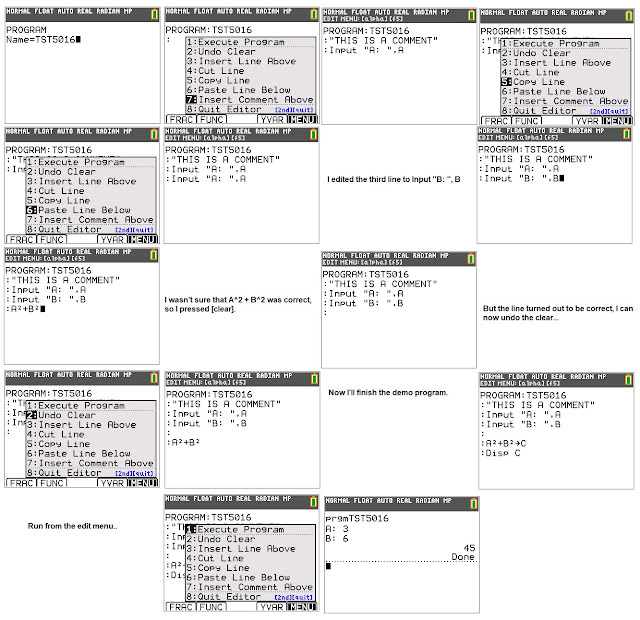 The program MAGICSQ3 generates random 3 x 3 non-normal magic squares. The sum of each row, column, and diagonal are given. Ever needed to end a loop early? Find yourself executing a loop where the counter becomes a value that causes an execution error? An example where this might happen is a loop where a function is divided by the counter variable, and during the loop the counter variable takes the value of 0. 1. You can terminate the loop at that point by using BREAK. 2. You can skip that loop’s iteration by using CONTINUE. You can specify how many loop structures are affected by using either the BREAK n or CONTINUE n format. We can see that the counter will have a problem when the variable reaches 0. Division by 0 will cause an error and stop execution. We are going to use BREAK and CONTINUE to mitigate this problem. In this case when the for-loop encounters x=0, that iteration is skipped and the loop continues. You can join strings with the plus symbol ( + ). The nice thing is that you won’t need to import any modules for the above string functions. Please type some text. This is my demonstration. You can create user functions (subroutines) in python by the def structure. You return results by the return command. The piecewise( function is added to the Math menu under the math submenu, option B. As a result, the equation solver has been moved to option C. The piecewise function can hold from 1 to 5 pieces. Version 5.3 adds 16 test templates involving the variable X to the Test menu ([2nd] [math]). This is meant to compliment the new piecewise function, especially in function graphing. However, the variable can be changed as needed. The screen shot below shows a condition template with a piecewise function. When a function is drawn, you can calculate and draw the tangent line at any continuous point while you are on the graph screen. Version 5.3 adds the option to store the Tangent line to any available graphing equation (Y# for example). The new functionality is available only in the Function mode. To generate the Tangent line, press [2nd] [prgm] (draw), option 5 to call up the Tangent command. Arrow to the desired point. Press [graph/f5] (MENU) for options. Select your options, then press [enter]. Use either arrow keys or enter a number to get to a point and commence drawing the tangent line. A demonstration is shown below. It’s been a long time coming: the TI-84 Plus CE now has editing tools! We now can insert comments (comments are indicted with quotation marks), insert blank lines, copy, cut, and paste lines. There is even an option to execute the program immediately. It is all accessible from pressing [alpha] [graph/f5]. You can now run archived programs without unarchiving the program into RAM first. We still need to unarchive programs in order to edit them. * Running assembly programs will no longer require the asm( command. * The fraction bar can be called by [alpha] [X,T,θ,n]. This program will require that you have both numpy and matplotlib. If you are working with Pythonista for the iOS, the two modules are included. Other versions of Python require that you download matplotlib and numpy separately. 1. The module numpy works with functions with lists as arguments. There is a math function associated with numpy. See the section on numpy functions below. 2. It is helpful to set up all the graphing parameters before showing the graph with pylplot.show(). 4. To turn the plot grid on, use pyplot.legend(). To turn on the legend on use pyplot.legend(). Labels are defined in pyplot.plot. numpy.add(list 1, list 2) Adds two lists, element by element. numpy.subtract(list 1, list 2) Subtracts list 2 from list 1, element by element. numpy.mutiply(list 1, list 2) Multiplies two lists, element by element. numpy.divide(list 1, list 2) Divides list 1 by list 2, element by element. numpy.power(list 1, list 2) Calculates list 1**list 2.
numpy.maximum(list 1, list 2) Takes the maximum of each respective pair. numpy.minimum(list 1, list 2) Takes the minimum of each respective pair. numpy.round(list, number of decimal places) Round each element. * Exception: years that are divisible by 100 but not divisible by 400. Example: 2000 is a leap year, but 1900 and 2100 aren’t. I would like to thank Gamo for this question. There is no dedicated keys on the HP 12C for this, but we can use either the percent change key ([ Δ% ]) key or the TVM keys. Clear the registers before you begin. For this exercise, PMT = 0. N = 1, PV = -25, FV = 36. Solving for i gets 44. N = 1, PV = -36, FV = 25. Solving for i, then pressing [CHS] obtains 30.56. What is good about the above method is that you can solve for any of the variables. Detailed algorithms for business calculations can also be found in the HP 12C Advanced Solutions Handbook (see source below). For the Platinum edition of the Solutions Handbook, refer to page 92. This program generates a list of random numbers between 0 and 1, using the pseudo-random number generator frac((π + t)^5). To use a pseudo-random number generator, you will need an initial seed. This program uses the fractional part of the number of ticks from January 1, 1970. To get ticks, you will need to import the time module. Call the number of ticks by the time.time() function. 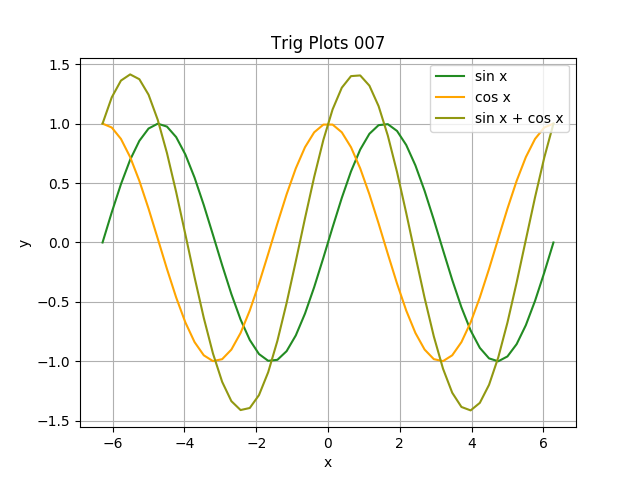 The function math.trunc(t) truncates t and returns the integer part. Keep in mind, to generate n items, use the for loop with the in range(0, n-1). # will be an integer as range requires.